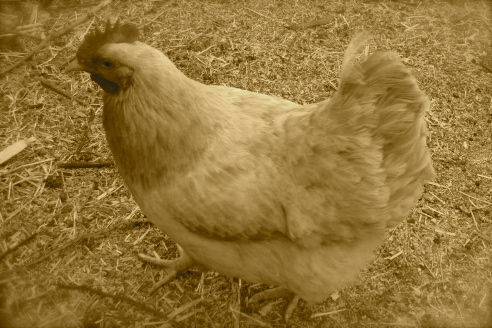 Chickens are like love stories she mumbles through half awake pre-dawn slumber, her sentiments echoed by the solitary hen shouting out the dawn, her loneliness, her need from a perch in the fig tree. I hate that bird he grumbles and pulls her closer as they drift back to sleep. “Chicken!” He screams as he pumps his arms up and down wildly from his position perched on the jagged rocks down below. She leans backward even farther as her toes inch towards the cliff face. Cautiously leaning out over the precipice while keeping her left hand clenched on the uneven rocky slope, she watches the frothy swirls pouring off the waterfall at least twenty feet below. That irritating voice in her head begins shouting in the hopes of drowning out thundering heartbeats and the water’s rush. “You don’t have to prove anything to him…why does it matter what he thinks of you…why are you so afraid anyway…and hey, if the eleven year old could do it so can you…” all rush through her mind in a matter of moments. Unfortunately she finds herself paralyzed, legs absolutely refusing to follow any command whatsoever. She can neither move forward nor edge back from the cliff face. Time is ticking away and along with it whatever dignity or sense of bravado she had carried up that rocky trail, her traitorous jelly-legs frozen in the same maddening posture of terror. Suddenly, his little daughter’s slender fingers slip into hers. “Do you want me to jump with you?” she asks gently. Her face is drawn into such a smile of sincerity that she feels a rush of warmth spread outwards from her heart. Okay. “We’ll jump together”, adds her eleven-year-old rescuer. As they stand there on the edge of the waterfall together counting to three, the woman smiles and leans forward, letting go of the rock face. They scream as they fall, momentarily suspended in time. The cold water hitting her body causes the woman’s skin to tingle. They come up laughing and hold hands as they swim to the embankment where he embraces them both and softly whispers, “I love you”, in the woman’s ear. She has never before felt so alert, scared, cold, and exhilarated simultaneously in her life. You know what’s nice about chickens she says. Chickens know when to hunker down. As she watches the chicken nestle into the folds of her sweatshirt, she is reminded of her need to wrap herself in the warmth and comfort of a flock. The hen shakes off the early morning, softly plumps her feathers, letting out one last little peep as her eyelids slide closed. The woman is still, afraid to breathe too deeply, move too quickly; not wanting to jostle the tiny chicken out of her comfortable position. She wraps her whole body around the tiny frame, legs pulled in, feet tucked under, the hen nestling its beak underneath her chin. She can hear him making tea in the kitchen; feel the frost in the air licking at her nose and exposed fingertips. Here. Have some tea and rest he croons. You deserve it, he whispers. She feels the folds of his daughter’s down comforter falling loose around her and smiles as he carefully tucks in each end. She wants to keep this little chicken warm. She wonders if chickens dream, and slowly lets her own eyelids droop, sleep washing over her. In her dream, she is a diminutive gray chicken scratching in a patch of sunlit grass. Later, when she awakes, they talk about chickens. This foolish hen actually prefers the company of humans. She eats cupcakes off the counter, plays with the dog, and sometimes can be found roosting on the feather pillow of his bed. Perhaps since she is alone she has come to think she is human. No, he argues, she thinks we are in fact chickens. The woman knows that in the soft down of chicken feathers there is a smell a little like dust and old places and for some reason it makes her think of home. She knows that their tiny beaks and sharp squeaks make her feel protective, brooding, hovering as if they were hers. In her heart she knows that nothing is truly hers though, except perhaps this yearning, and she wonders if the tiny hen feels it too. Chicks are small and comforting and they have no problem with nestling down deep in your bosom, rustling feathers, and falling into a gentle sleep as warmth takes over their fear. Everyone can take in a tranquil moment holding a baby chick, let the world stand still, touch fingertips to budding feathers, brush hands and feel a spark of warmth. Baby Chicks snuggle together for warmth and comfort. She holds these three tiny chickens in her giant hands. She remembers. Spice racks, dry storage shelves, the pantry she and he snuck into in the dark to satisfy their panicked moments of lust. She knows that somehow holding these soft baby chicks and feeling their tiny hearts beating so fast helps her to will hers to continue beating as well. Their sharpened baby claws dig in to her palms, each one a point of pain binding her to the moment. She does not see him but feels him slip down onto the floor without a sound. He gently lifts the small black chick out of the folds of her shirt. They sit in the pantry, on the cold floor, shoulders touching, cradling the baby chicks, and saying nothing. I could fall asleep like this she says. Me too, he says and nestles his head into the crook of her shoulder. Her eyes slide closed. The day the chickens are murdered she writes him a poem. She tells him that despite the tragedy of their departure they must have lived in a veritable chicken heaven according to chicken standards. She neither expects nor hopes that this will take the pain, but rather that it will make it beautiful, sweet, a thought for savoring. I have always loved the way the chickens seem excited about each new day. As if it was their last, he says. No, she responds. As if it was their first. there’s no stopping these chicks. yeah, not so bad at all. “Ms. Heidi” graduated with honors from the 2009 Summer Institute of BAWP. Since then she has distinguished herself in the noble art of juggling family, friends, personal hygiene, creative pursuits, district politics, and classroom instruction with the serenity known only by the truly obsessed. She enjoys short walks broken up by long periods of time and continues to make promises about the bikes she will ride, the homes she will buy, and the many talents she will fine tune with the dedication of those gifted with free time. Above all else, she finds that she loves teaching but hates schooling. Absolutely stunning poem. I plan to reread and savor this many times over. And I’m going to copy it and give it to the woman whose gorgeous chickens (each one named after an old movie star) provide my eggs each week. Her name is Carol, and the first time I stopped at her roadside shop, she squealed “Miss Claggett!” Turns out she was one of my students in the 60s and I hadn’t seen her since she graduated as we both moved up here to Sonoma County. Thank you for this treasure, Heidi. Fabulous work you did here!!! Wonderful light, great posing, strong angles. Love it!! !